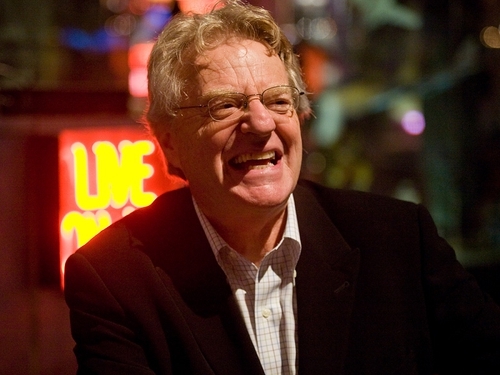 'America's Got Talent' host Jerry Springer will join Eurovision winner Linda Martin and Eurovision commentator Marty Whelan on the expert panel for Friday night's 'Late Late Eurosong Special' on RTÉ One at 9.35pm. The six Eurosong 2009 finalists were selected from a public competition and Friday night's winner will be decided by votes from regional juries and the public in a 50/50 ratio. The regional juries will be based in Cork (presented by 'Ice's Sinéad Kennedy), Sligo (presented by 'News2day's Paddy McKenna), Limerick (presented by 'Den Tots' host Emma O'Driscoll) and Dublin (presented by 'Kazoo's Kathryn McKiernan). 'Flying', performed by M.N.A and composed by Ronan McCormack. 'Out of Control', performed by Laura-Jayne Hunter and composed by Derry O'Donovan. 'So What', performed by Lee Bradshaw and composed by Billy Larkin and Kevin Breathnach. 'Amazing', performed by Johnny Brady and composed by Tony Adams Rosa. 'I Wish I Could Pretend', performed by Kristina Zaharova and composed by Lauris Reiniks Gordon Pogoda. 'Et Cetera', performed by Sinéad Mulvey and Black Daisy. Composed by Niall Mooney, Jonas Gladnikoff, Daniele Moretti and Christina Schilling. For more on the finalists, visit RTÉ's Eurovision website. The Eurovision Song Contest semi-finals will take place on Tuesday 12 and Thursday 14 May in Moscow and will be televised live on RTÉ Television.